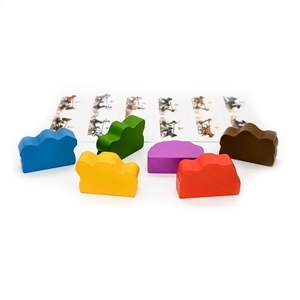 This is a listing for only the Chariot Race: Charioteer Meeples. You will need a copy of Chariot Race to use this item. Chariot Race: Take a trip through time as a chariot racer during the age of Rome. The competition is fierce and all contestants will stop at nothing to win the day! Tactical movement and combat is used to great effect in Chariot Race, but be warned there are many ways to wreck, so only the most cunning and tenacious will see the finish line! May Fortuna smile upon you. Combat with Javelins, Caltrops, and even Ramming Speed! Supports 2 - 6 Players!